How to Glue the Spike of a Kendama. How to Glue the Spike of a Kendama Kendama TrickIn this video we are going to talk about how to glue your kendama spike, or use Spike Armor as we like to call it. 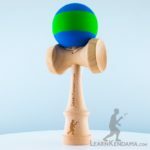 The reason that you want to do that is because any wooden kendama the spike naturally breaks down as you start to do some different tricks. So I’ll show you a little experiment that we did here at LearnKendama.com, this is a kendama, I opened these at the same time, and then I glued the tip on this one, I did not glue this one. What I did is I did the same tricks and the same amount of tricks on both kendamas over and over again for about a period of three weeks and you can see just how dull this tip got. This one here that I glued the tip is still actually very sharp, it still looks like it came out of the box, minus that it is glued. What is also neat is that this, kendama that I did not glue I stopped using after the 3 week period but I still have been playing with this one for about six months and it is one of my main kendamas, you can see the spike is still really good. That is the benefit of glueing is it helps to make your kendama last longer, it really helps keep just the value of that kendama for you so that you can continue doing all the tricks that you need. So to get started, what you are going to want is a paper towel, help protect getting glue on any surfaces. You will want a paperclip, you will need your superglue, or spike armor as we call it here. Depending on what kind of superglue that you use, you know they work a little different and what we did is we went out and we found what we thought was the best superglue, the one that really got into the pores of the wood the best, that was the right thickness the right type and so we made that readily available to you our customers that is called Spike Armor, it is right on our store. You will also want you know depending on the glue you have you may need to cut the tip or puncture it with a pin, which is what you have to do to Spike Armor, either of those will work. You may also want some tissue, to help wipe away any excess, but one note is that if you are not using Spike Armor, some of the superglues will actually dry very quickly and if you try to wipe away any excess with the tissue that tissue will actually stick to the spike of the ken so if you are not using spike armor you may want to avoid the tissue. Another thing is make sure you are being safe, do not try to get the glue, or avoid getting the glue on your hands or anything like that and of course along with anything else. So what you are going to do to start this off is open up your glue and when you look at the spike of a kendama you can see we got the very tip of it here and then it comes down and widens out and levels off here where it becomes part of the shaft and when we glue the spike we actully want to do it from about here towards the tip so you want to try to avoid getting too close to this leveled off part that becomes the shaft. The reason for that is that glueing that area will cause the glue to break down a little bit faster, it might interrupt some tricks. Some other things that may interrupt tricks is if you use, if you put on too much glue or you glob it on it will form like a hard casing around the spike and what will happen is as you are playing with that is it will break and fall off and you will have to reapply that glue sooner and what is great about the Spike Armor that we have is that it helps to avoid that, it really gets into those pores and it is a very, it is just the right type of glue that keeps it from coagulating quite that way. So when you are ready, I have already punctured the hole of my glue so I do not need my tip. What I am going to do is I am going to apply a very light amount, I go right at about the center of the tip, I let just a little bit come out and what you are going to notice is as it is coming out, I really got a very little amount coming out, you may need to re-puncture your tip a little bit. Pull that out. When the glue starts to come out you really want to apply a very thin layer, so you can see is the color starts to change, that is really all I am aiming for here is just get the color of the wood to change. Any thicker than that, and it will start to stick to itself rather than binding into the pores of the wood. You are just going to go around the whole spike kind of like this, just getting it all a bit wet with the glue and get that color change. Then what I like to do at the end of it is i take a paperclip and I like to smooth it out and scrape just towards the tip and that helps the glue from sticking to itself or piling up. Make sure I can get any excess off. When you happen to get any on the shaft that is when you can take the tissue paper and kind of wipe that off but again you can see just how much space I left so I did not really get down toward that shaft. The one thing, you can put the kendama down on something or just hold it, the glue usually only takes, I give it two or three minutes, to kind of harden. Before I apply my second coat usually I will apply two or three coats and the benefit of holding upside down is that if there is a little bit too much excess it will run down towards the tip of the spike rather than coagulating in any one area. I will apply my second coat a little faster here, but just once it is dry you are just going to do the same thing, you are going to bring it out again, sometimes on my second coat I will try to get a little closer to that area that flattens out near the shaft, but it is the same thing, a very very light coat again because if you put too much on it sticks to itself and the coat breaks down faster. If you do this just right and you get the glue and everything set up right you should not need to apply the glue later on, it should last a really long time. But at any point if you notice that any glue is breaking down or just that your spike is becoming more damaged than you like you can just feel free to go through the glueing process again, you know just put on another coat here and there as you see fit. But that is how you glue the spike on your kendama.